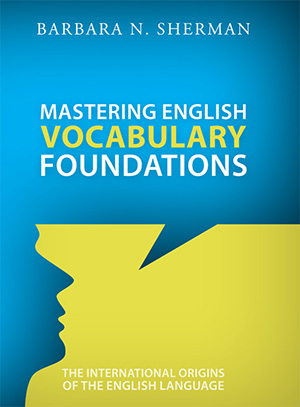 Liberty University Press is proud to announce the release of “Mastering English Vocabulary Foundations” by Liberty faculty member Barbara Sherman. For centuries, people have studied the English language and its derivations. The English language has been influenced and adapted by numerous cultures, vernaculars, and belief systems, such as Greek, Latin, French, and mythology. This resulted in the formation of more than one million words. Yet, many people are unfamiliar with the depth of vocabulary available to them. Barbara Sherman has been at Liberty University since 1982 (30 years), serving as a professor and administrator. She firmly believes that building a strong vocabulary will enable students to conquer assignments and present themselves well when speaking and writing. Sherman has been a high school English teacher; a school principal; a professor of Education, Psychology, Freshman Seminar, and Study Skills courses; director of the Bruckner Learning Center; and the executive director of all academic support systems at Liberty. She is currently teaching a speed reading/advanced vocabulary course (CLST 301) on campus while serving as the director of individualized study programs (Individualized Studies and Interdisciplinary Studies Degrees) and the Center of Professional and Continuing Education.